Buy Katt Adachi a Coffee. ko-fi.com/kattadachi - Ko-fi ❤️ Where creators get paid by fans, with a 'Buy Me a Coffee' button. 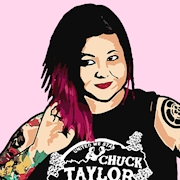 hi i make shirts for wrestlers and wrestling fans and i draw stuff sometimes and i do it mostly for free/out of pocket. also i drink a lot of coffee and i already feel bad for doing this. Secured Payments. Support goes to Katt Adachi's account. Upgrade Katt Adachi to a yearly Gold Membership with a one-time payment.